Carbon partitioning between ferritic and austenitic phases is essential for austenite stabilization in the most advanced steels such as those produced by the quenching and partitioning (Q&P) process. The atomistic analysis of the carbon partitioning in Q&P alloys is, however, difficult owing to the simultaneous occurrence of bainite transformation, which can also contribute to carbon enrichment into remaining austenite and hence overlap with the carbon partitioning from martensite into austenite. Therefore, we provide here a direct atomic-scale evidence of carbon partitioning from martensite into austenite without the presence of bainite transformation. 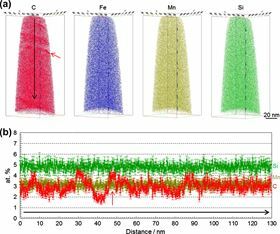 Carbon partitioning is investigated by means of atom probe tomography and correlative transmission electron microscopy. A model steel (Fe–0.59 wt.% C (2.7 at.% C)–2.0 wt.% Si–2.9 wt.% Mn) with martensite finish temperature below room temperature was designed and used in order to clearly separate the carbon partitioning between martensite and austenite from the bainite transformation. The steel was austenitized at 900 °C, then water-quenched and tempered at 400 °C. Approximately 8 vol.% retained austenite existed in the as-quenched state. We confirmed by X-ray diffraction and dilatometry that austenite decomposition via bainite transformation did not occur during tempering. No carbon enrichment in austenite was observed in the as-quenched specimen. On the other hand, clear carbon enrichment in austenite was observed in the 400 °C tempered specimens with a carbon concentration inside the austenite of 5–8 at.%. The results hence quantitatively revealed carbon partitioning from martensite to austenite, excluding bainite transformation during the Q&P heat treatment. This paper was originally published in Acta Materialia 65 (2014) Pages 215-228.